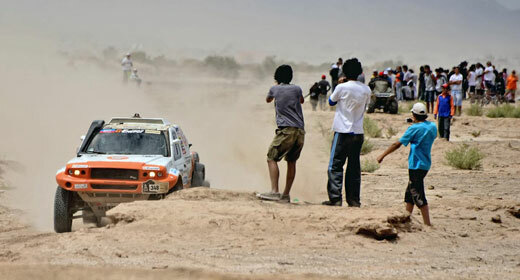 G-Force Team: Dakar is done, but not without a twist in the tail! Just one more stage to go… It’s easy to say, but this is the Dakar where dangers wait every inch of the way to catch crews out, and in the South American mountains Lady Luck is a fickle woman. At 128km, apart from the first day’s prologue, the last stage was the shortest of the whole event. After two weeks of racing it should have been a formality. But no, it almost ended in disaster for Vladimir Vasiliev. The stage was split into two timed sections and near the end of the first something in Vasiliev’s gearbox broke. And with the end almost in sight… There was no time for the chase crews to be able to do anything but fortunately Lady Luck came with the bright orange Mitsubishi of Vadim Nesterchuk. The Ukrainian hero towed the stricken G-Force out of the stage, through the neutral section and into the second part of the stage, where team mate Boris Gadasin was waiting. But this wasn’t the end of the journey, no, it was the beginning! But ask anyone outside the Top 5 who hasn’t been doing this for years and doesn’t have a massive team behind them and they will all tell you that the Dakar is all about overcoming adversity and getting to the end no matter what and that is what the rookie Russian team had to do. Only 10% of first-timers finish the world’s toughest motorsport event and with the help of a tow-rope at the very end both the G-Force Protos made it all the way from Lima in Peru to Santiago in Chile, 4155 competitive kilometres over 14 days.